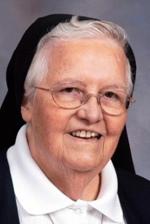 Sister Marie Joan Flemming, I.H.M. Sister Marie Joan Flemming died Nov. 1 at Camilla Hall, Immaculata in the 69th year of her religious life. She was 86 years old. Born in Philadelphia, Sister Marie Joan entered the Congregation of the Sisters, Servants of the Immaculate Heart of Mary in 1947 from St. John the Baptist Parish in Manayunk and professed her vows in 1950. She taught in various elementary schools in the Archdiocese of Philadelphia and the Diocese of Arlington. In 1997 she joined the staff at Camilla Hall. The funeral Mass was celebrated Nov. 7 at Camilla Hall. Msgr. Joseph Logrip was the celebrant and homilist, and the concelebrant was Father William E. Dean. Sister Marie Joan is survived by members of her religious community, by her sister-in-law, Patricia Flemming and many loving nieces, nephews, grand-nieces and grand-nephews. She was predeceased by her parents, John A. and Rose M. Buffington Fleming, her brother John (Eleanor), Joseph (May), Eugene, and a sister, Mary McCormick (Vincent).